Update (8:40 am ET): The following countries will receive 'temporary' waivers excusing them from US sanctions on Iranian oil exports. While several European countries that applied for a waiver didn't receive one (reports last week noted that the US had refused to grant a waiver to the European Union as a whole), Italy and Greece did receive waivers. Pompeo noted that "European businesses have already made their decision and they're deciding not to do business with Iran." U.S. is sanctioning more than 700 "individuals, entities, aircraft, and vessels" in Iran as the Trump administration fulfills its pledge to ramp up pressure on the Islamic Republic over its “malign” behavior in the Middle East." 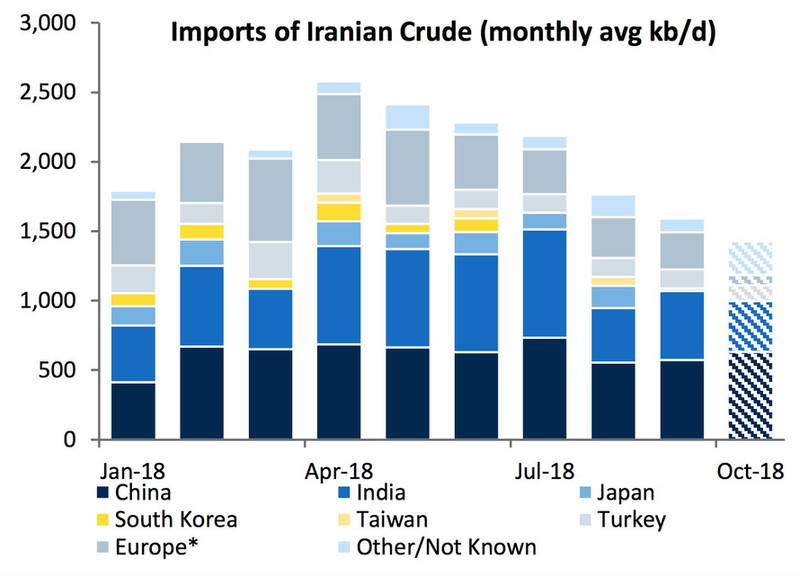 To help put this into context, here's a breakdown of Iranian crude shipments. In what some have characterized as a capitulation by the Trump Administration, Secretary of State Mike Pompeo is expected to announce the 8 countries that have received 'waivers' from US sanctions on Iranian oil exports during a Monday morning press conference. Treasury Secretary Steve Mnuchin is also expected to speak.